On the surface, postpartum depression (PPD) looks much like other forms of depression. New mothers struggling with it often withdraw from family and friends, lose their appetites, and of course, feel sad and irritable much of the time. However, many people and clinicians have underestimated the uniqueness of mood and emotional disorders that arise during pregnancy or shortly after giving birth. Psychologists explore the neurobiology of postpartum depression and anxiety in a Review published January 24 in Trends in Neurosciences. "Motherhood really can change the mother, which is something we often overlook. And we forget about examining the neurobiology of maternal mental health and maternal mental illness, particularly anxiety," says behavioral neuroscientist Jodi Pawluski of University of Rennes 1 in France, who co-authored the paper with Joseph Lonstein of Michigan State University and Alison Fleming of the University of Toronto at Mississauga. 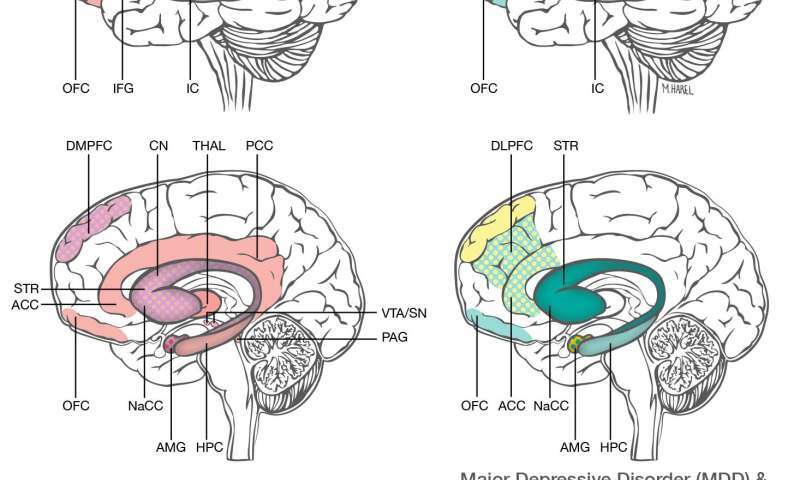 Overall, fMRI studies show that neural activity in women with PPD compared to people with major depression who had not given birth involves distinct patterns for new mothers with PPD. For instance, the amygdala is usually hyperactive in anxious and depressed people, but for the women with PPD, the amygdala can actually be less activated. PPD is now listed as "perinatal depression," a subset of major depression, in the Diagnostic and Statistical Manual of Mental Disorders (DSM-5), the text which sets industry standards for diagnosing mental conditions. Postpartum anxiety isn't included at all in the DSM-5, even though 1 in 7 new mothers are affected by it, Pawluski says. Postpartum anxiety is estimated to be just as prevalent as PPD, even though it receives far less attention in the literature. Many of these mothers aren't depressed, so their condition remains largely unaddressed. "When we talk about the neurobiology of postpartum depression and anxiety, our information from the studies done on humans is only comprised from about 20 papers," says Pawluski. "If you think that 10%-20% of women during pregnancy and the postpartum period will suffer from depression and/or anxiety, and then you realize there are only 20 publications looking at the neurobiology of these illnesses, it's quite shocking." Postpartum mood disorders not only affect mothers but also their infants. New mothers experiencing postpartum anxiety or depression are more likely to snap at their infants and may have trouble forming a bond. "The depressed mothers can be more intrusive or irritated by their infants, but they can also be more detached or withdrawn, and this is also seen with anxiety postpartum," says Pawluski. Those early interactions can have a long-term impact on infants' health. Children of depressed mothers have higher medical claims than do children of healthy women because they bear a higher burden of illness, use health care services more frequently, and have more medical office and emergency department visits than do children of non-depressed mothers. The annual cost of not treating a mother with depression, in lost income and productivity alone, is estimated to be $7,200. Still, despite affecting nearly 1 in 10 women, PPD and postpartum anxiety are still treated as extensions of major depression and generalized anxiety disorder, respectively. The experience of postpartum depression can be further complicated by the fact that women are expected to enthusiastically embrace their new motherhood. Many women with postpartum mood disorders don't feel that they can discuss the issues and feelings they're having openly. Pawluski, who herself is a mother of two, says of new parenthood, "It's a life changer. It's fantastic, terrifying, amazing, frustrating, exhausting, thrilling, and everything in between. It is not always a happy time, and we need to understand that, talk about it, and figure why it can trigger mental illnesses in so many women. If we can improve the health and well-being of the mother, we will improve the health and well-being of the child and family."